The Environmental Protection Agency (EPA) under Lisa Jackson, who was responsible for banning bear hunting in New Jersey, is now considering a petition by the Center for Biological Diversity (CBD) — a leading anti-hunting organization — to ban all traditional ammunition under the Toxic Substance Control Act of 1976, a law in which Congress expressly exempted ammunition. Environmental activists want to ban lead shot, lead-core bullets, and even fishing sinkers. If the EPA approves the petition, the result [could] be a total ban on all ammunition containing lead-core components, including hunting and target-shooting rounds (even rimfire ammo). The EPA must decide to accept or reject this petition by November 1, 2010, the day before the midterm elections. 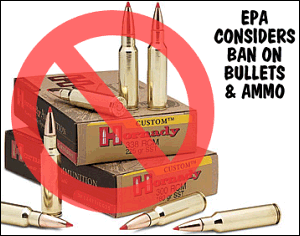 Click Here for More Details on EPA Petition to Ban Lead Ammo and Components. From 8/26/2010 through 10/31/2010, the EPA is inviting comments on the Ammo Ban Petition. The NSSF urges hunters and shooters to submit comments to the EPA opposing any ban on traditional ammunition. Remember, your right to choose the ammunition you hunt and shoot with is at stake. The EPA has published the petition and relevant supplemental information as Docket ID: EPA-HQ-OPPT-2010-0681. To read the original petition and see the contents of this docket folder, CLICK HERE. To go directly to the ‘comment’ page for this docket number, please CLICK HERE. 1. Submit a comment to the EPA opposing the Ban. CLICK HERE to COMMENT. 2. Contact your congressman and senators and urge them to stop the EPA from banning ammunition. Share the post "EPA Considering Ban on Traditional Ammunition and Bullets"
Leupold has launched a dedicated website to educate hunters and shooters about the Custom Dial System (CDS™) feature for VX-3® riflescopes. The innovative CDS system is darn clever. Basically what Leupold has done is create calibrated elevation knobs that allow hunters and varminters to simply dial the yardage to their targets, rather than input a specific number of clicks. For example, to shoot a buck at 300 yards, you simply rotate the elevation turret to “3” on the scale. CDS helps hunters and shooters get on target at any range, with any load, by matching their scopes to the ballistics of their ammunition. Leupold’s CDS system is a user-friendly invention that can really simplify shooting at multiple yardages. The big single-digit Arabic numerals on the elevation dial correspond to 100-yard intervals, while the smaller numbers show 50-yard intervals. (Click values are otherwise 1/4-MOA.) No longer do you have to remember specific come-ups for particular distances. For the CDS system to work correctly however, your load’s ballistics must match a set of master loads that Leupold uses to calibrate the dial scales. Hunters using most common cartridges should find a calibrated load that matches their muzzle velocity and bullet BC. CDS turrets are available on these scopes: VX-3 3.5-10x40mm, VX-3 3.5-10x50mm, VX-3 4.5-14x40mm, VX-3L 3.5-10x50mm and VX-3L 4.5-14x50mm. 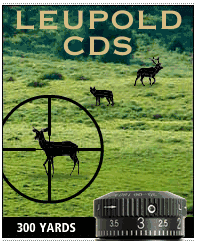 Leupold’s CDS system is explained at www.leupold.com/VX-3CDS. Visitors to the VX-3 CDS webpage will find an educational video and graphics, an overview of how the system works and its advantages, and details on a special offer. With the purchase of any VX-3 CDS riflescope, shooters receive two customized, ballistically-matched adjustment dials ($100 retail value) at no extra cost. This offer ends December 31, 2010. Click the image below to learn more (turn down your speakers before clicking as a loud video will auto-play). 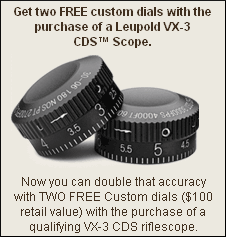 Share the post "New Leupold Calibrated Scope Dials — CDS™ System"
Multi-Gun Competition is fast and exciting. With plenty of action and lots of fire-power, multi-gun matches are crowd-pleasing events that play well on television. The 3-Gun Nation TV show has been a popular addition to the Versus Channel this year. 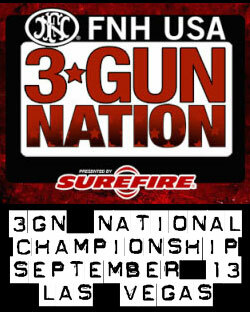 3-Gun Nation culminates its inaugural season on September 13 with the 3GN Championship at the Desert Sportsman’s Rifle & Pistol Club in North Las Vegas, where the top 3-gunners in the country will battle for $40,000 in cash prizes. Immediately preceding the 3-Gun Nation Champsionship, the 4-day USPSA Multi-Gun World Championships will be held September 9-12 at the same Desert Sportsman’s Club Range. Shooters will compete in five divisions: Standard, Standard Tactical, Open, Heavy Metal Standard, and Heavy Metal Tactical. AccurateShooter.com will be on hand to cover the action. Nearly 230 shooters will compete during this 3-day competition with nine stages of fire. Stages feature the natural terrain and hills of the Ozark Mountains on 1,000 acres of land. “We like to be challenging, but fun,” said Match Director Kirk Broyles. “We want to make sure the most experienced shooters are challenged and enjoy the match, but that new shooters can compete and won’t be overwhelmed.” Run by the Adams Arms Shooting Team, the Ozark 3-Gun Championship held its first competition just last year. The match gained NRA-sanctioning in 2010. Share the post "Major Multi-Gun Championships Coming Soon"